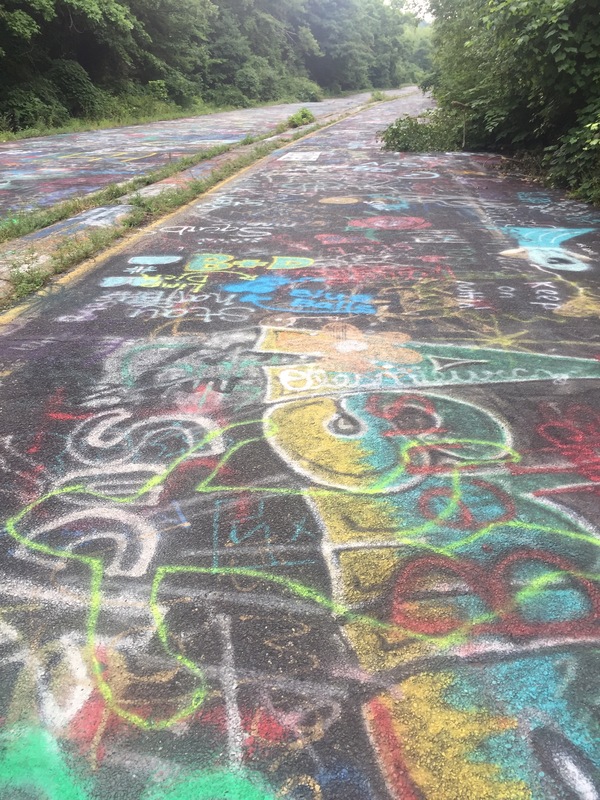 We stopped by an area that has become known as the Graffiti Highway – the main road leading into Centralia was closed off and over the years people who have wandered back there have left their mark on literally everything possible: the road, rocks, and even leaves on trees and bushes. It is surreal to see this area that is tucked away – you would miss it if you didn’t know where it was. It’s not hard at all to find – actually right off the new road that goes into the center of the town, but it just looks like dirt piles and overgrown vegetation from the outside. 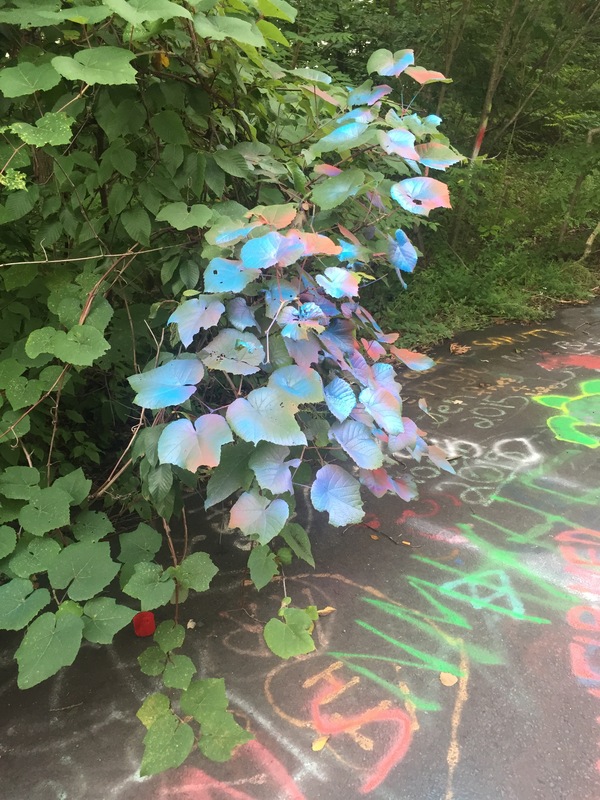 I have mixed feelings about graffiti – I can appreciate it when it’s actually a picture of something, but when people just paint dicks and curse words (which is what the majority of the graffiti here is) its just stupid….and ya know there’s the whole vandalism thing. 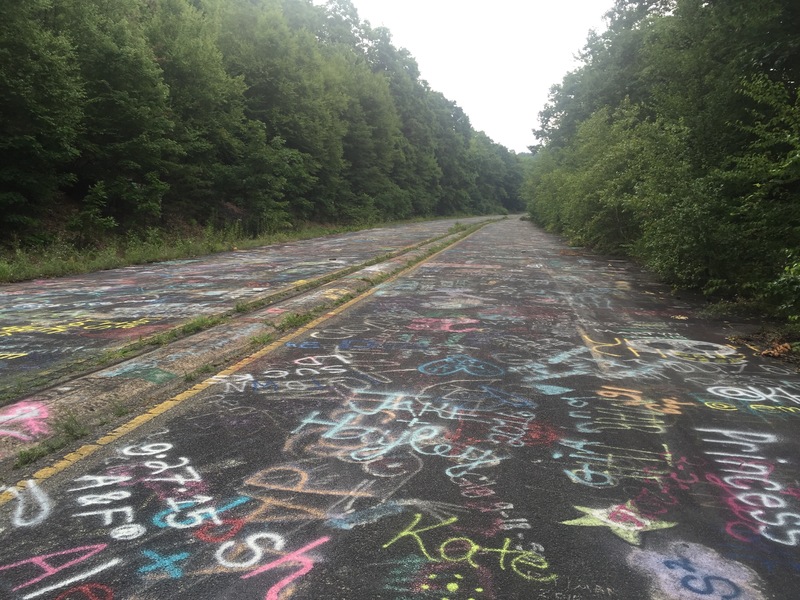 I will say I absolutely can not stand it on scenic trails (like the pinnacle in PA along the AT), but here….a long forgotten unused section of road – is it really hurting anything? It just adds to the eerie feeling of the town. It is crazy to see how much more graffiti there is now – the last time I was here was in 2009 while shooting a zombie webisode for my friend —ohhh yeah – I got to be a zombie with fake blood, cool contacts that whited my eyes out and everything….too bad I didn’t get to eat anyone before I was shot in the head and killed – LOL! Quite a difference in the road huh? Also you can see a tiny bit of smoke escaping from the cracks in these pics. 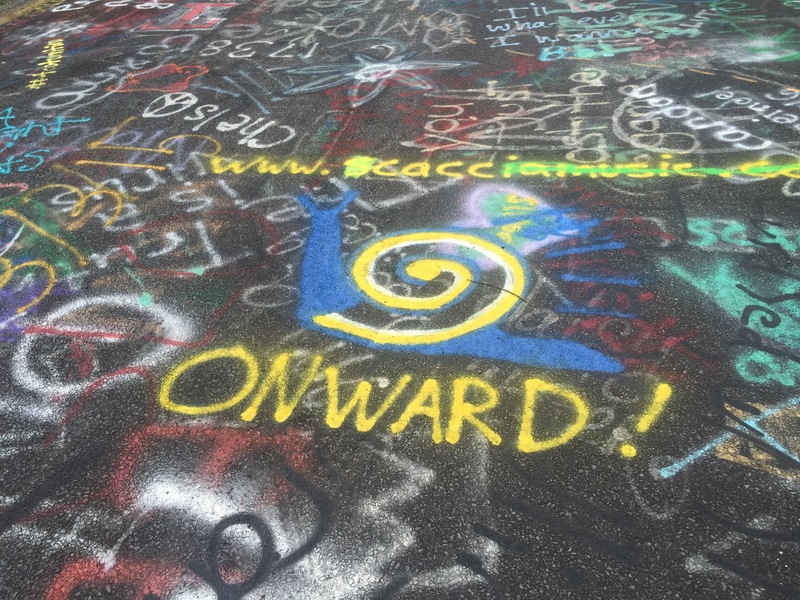 What are your thoughts on graffiti? Anyone else ever visit here or have plans to go? 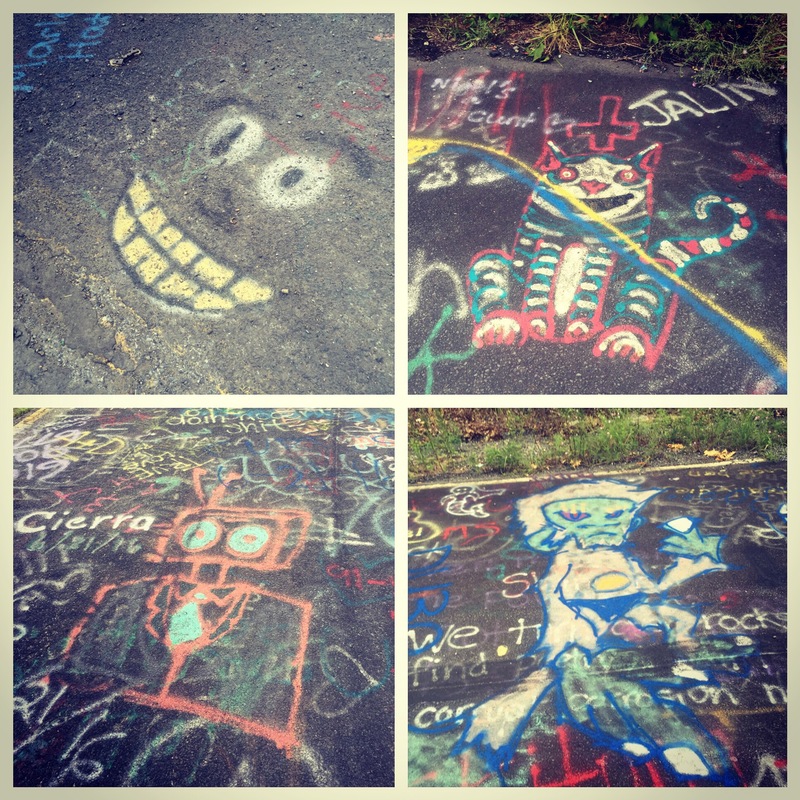 Click HERE for a great website about the Graffiti Highway and Centralia if you want more info! I have always been curious to visit but still never have. My thoughts on graffiti are very strong. It really bothers me. Especially like you mentioned about The Pinnacle and every time I go there it’s worse. Even more so at Boulder Field a National Natural Landmark. Really makes me sick. I love reading about your adventures though and you are always giving me more ideas of places to go. I will definitely have to check out Watkins Glen. Happy Trails Dana! 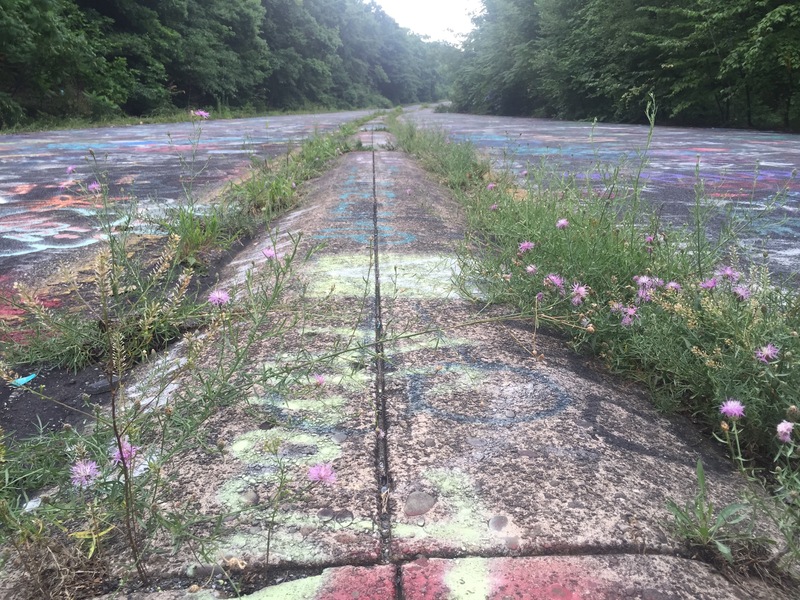 A couple years ago I visited the old Moonville Tunnel in Ohio. It was covered in graffiti, but there was this really elaborate painting of a train. I am not a fan of graffiti and really wish people would not do it, but that train piece was almost like art more than graffiti and I loved it lol! I’ve heard of this fire and the evacuation but I had no idea you could go visit. I think this needs to go on to “to travel to” list. yes – it is pretty neat – although there is not much left at all of the town – but still worth a look around to say you were there! HAHA! 🙂 thanks for reading! I’m so fascinated by this place. I always imagined that the town was blocked off for safety reasons – I had no idea that you could wander around! Yeah I always thought that too before the 1st time I went- I mean they evacuated the entire town- but as far as I know there are no signs saying keep out- there used to be more there like a bench that said Centralia and some kinda memorial but they were moved because they were worried people would ruin them- sad! Ya it makes the drive to the middle of nowhere worth it since the smoke from the fire is barely visible anymore! It’s pretty crazy! Thanks for reading!